A few months ago I was spending my Wednesday evening as usual at the action committee of Rise and Resist, the New York City direct action group which I have spent so much time with since the 2016 election. I always felt like the odd one out at these meetings. I seem to be the only one constrained by the limits of a 9-5 job, so often I cannot participate in the actions planned. But I go, and help out in small ways. And my politics seem to be a long way to the right of many of the others – I oppose Trump because he is a traitor and a fascist wannabe, not because I am dedicated to the overthrow of the capitalist patriarchy. I was also the only immigrant on the committee. Though of course as a Brit I am one of the “good” immigrants. I was no longer alone, another immigrant – I later learned from the Republic of Congo. On the other hand, she was still alone, as the only Black person on the self-selected committee, in fact the only person of color. I felt a feeling of kinship as she navigated her way through the conventions of the consensus driven committee, and the subculture of the American Left. Eventually the committee started planning a civil disobedience action at the Statue of Liberty. Unlike the majority of the committee, either retired or self-employed, I do not feel my job would be supportive if I was arrested. 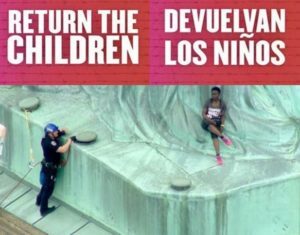 So I took a break from the committee, as they planned dropping a banner and wearing t-shirts to Abolish ICE to the Statue of Liberty. Patricia was one of the twenty who would go. I was as amazed as anyone else to learn that Patricia had decided completely by herself to scale the Statue in her own act of protest. I am totally in awe of her courage. Since then all of us have tried to support her in the whirlwind of publicity and legal issues. My little part has been with computer stuff, easy for me but I help how I can. And please contribute to her support, either by PayPal at https://patriciaokoumou.com, or by credit card at https://www.gofundme.com/support-for-patricia-okoumou. Nice writing about a subject near to my heart — feeling like an outsider within an outsiders group.